Our well-appointed conference room is equipped with all the audio/visual and convenience amenities you need to host a successful meeting. With its one-of-a-kind view of the airport ramp, it’s the perfect backdrop for your professional functions. Retractable screen and connectivity to the integrated projector for your presentations. Convenient pass-through access to the catering kitchen allows FBO staff to set up refreshments without interrupting your meetings. 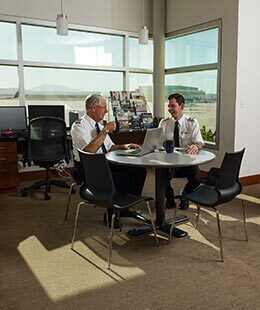 Our pilots’ lounge is equipped with leather recliners, office resources, kitchenette and dining table and wide-screen television. Join other pilots, socialize, relax and prepare for your next flight in our well-appointed lounge. What better way to unwind after a long flight than with a current feature film in our state of the art, luxury Stadium Theater? 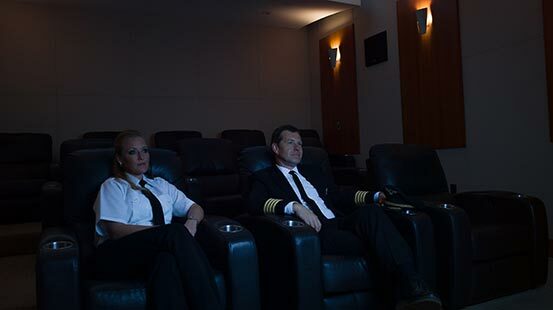 Our large theater is furnished with overstuffed leather recliners so you can watch movies in complete comfort. The surround sound stereo system and 72” wide-screen television will make you feel like you are part of the action. Check with the concierge staff on available titles then sit back and relax. Equipped with internet access, computers and other office resources, it’s the perfect place to plan the next leg of your trip. 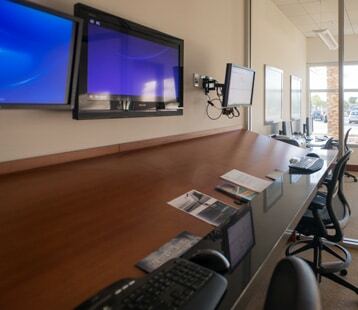 Well-lit, and easily accessible, our flight planning room is always available for you. 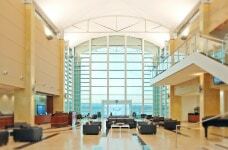 As you enter Luxivair SBD for airside, or landside, you will be immediately greeted by our exquisite environment. Travertine floors, cathedral height ceilings and natural light blend to create a warm environment for you. Luxivair SBD offers spacious, upscale hangars with competitive rates for overnight and short-term storage of your aircraft. 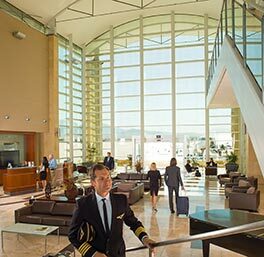 Our outdoor lounge offers a breathtaking view of the airport set against the impressive San Bernardino Mountains. Use our lounge at your leisure to conduct business or simply relax after a long trip under the warm California sun. 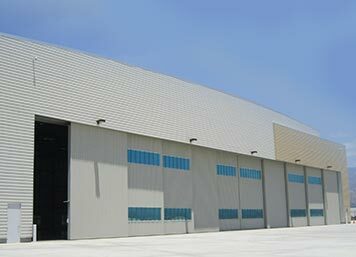 Luxivair SBD is the ideal location to establish your aviation business. With deluxe meeting space and a semi-private reception area, we have the ideal facility for your charter aviation operation. If a nice long nap is all you are thinking about after your flight, rest easy in the privacy of our well-appointed snooze room. It can hard to stick to a healthy lifestyle when you are always on the go. Luxivair SBD supports your health and wellness goals with the recent installation of an exercise room. Run, walk or step your way to fitness between your flights while watching aircraft arrive and depart.